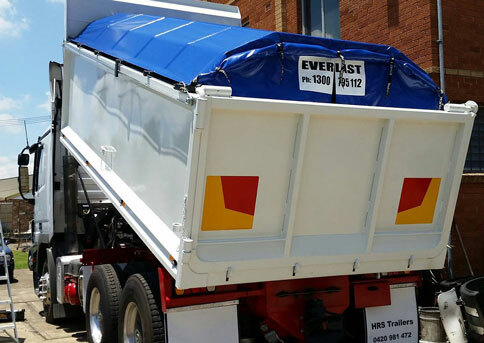 Everlast's PVC tarping systems are made from the highest grade PVC suitable for truck tarping systems. We use a single, continuous cable completely eliminating jamming as all bows are attached to the same cable. We also have a variety of bow heights at no extra cost. 90% PVC systems are designed for semi-waterproof coverage, heat retention and high level dust coverage for applications such as bitumen, excavation, top soil, sand, mulch and saw dust. 95% PVC systems are mainly used for bitumen and are fitted with a rear flap to keep more heat in the load. 100% PVC systems are designed for load types that require waterproof coverage such as grain, fertilizer and asbestos. This system has 120mm of side body coverage plus a 6 rope envelope flap complete with rubber rings and roll up ties. Motor Vehicle Repairer's Licence (MVRL) 55294.